The Zabludowicz Collection website is featuring the Mary Magdalene project. The set of seven images is in the collection. The Neuer Berliner Kunstverein purchased the work Al-Azzami Family from the series 'Vacant Seats' for its important Artothek collection. The Artothek, the largest German lending library for art works has now two pieces from Noel Jabbour in its collection. 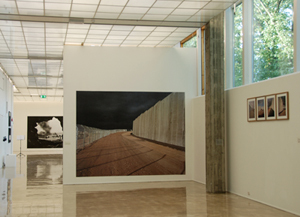 The first one, 'Before the Storm' from the series Segregation Wall was acquired in 2007.